All items must be tagged with a 3X5 index card that is taped, pinned, or tied on the item, or 1/2 of a 3X5 card if the item is small. The index card must have the consignor # in the upper left cornder. The description of the item in the center and the price in the lower right corner. SUNDAY is 1/2 price day. If you do not want to discount your item place an "ND" next to the price. 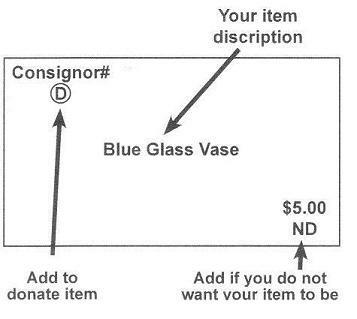 If you want to donate your goods, put a large "D" under your consignor #.